For the first time in its illustrious 33 week history, the “F.I.L.M. of the Week” column will have a two-part thematic series! In other words, this week is the first of two “F.I.L.M. of the Week” articles that ties into a common theme. The idea is to expose you to two animated movies that use the medium for different and exciting purposes. No doubt about it, these movies are no Disney or DreamWorks. These are movies made for adults with themes that reach farther and deeper than the normal animated audience. 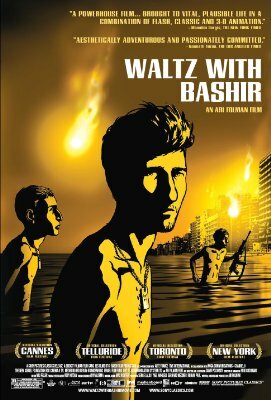 When I explain the genre of “Waltz with Bashir,” the first movie in the series, it will probably sound like an oxymoron. An animated documentary?!? How does that even work? But at some point in history, peanut butter and jelly sounded like a strange combination. Someone had to be bold and try it, and Folman should be remembered as a pioneer of a new style of filmmaking that I really hope will catch on. Using animation in a documentary is a fascinating way to make people’s memories come to life, especially ones that might be too costly or difficult to shoot in live action. Nothing is wasted and no holds are barred. Folman’s documentary revolves around a very intriguing concept. As a young man, he fought for Israel in the Lebanon War of the 1980s. Fast forward to the present day, and Folman has absolutely no recollection of anything that happened during the fighting save one memory of he and some comrades emerging from water completely naked. He begins to visit some people who might be able to jog his memory, asking them about their experiences. The stories slowly become more and more brutal, and Folman begins to remember. As the events are displayed before our eyes in animation, we begin to realize just how terrifying the experience was for these soldiers. Some Israelis stood by and watched genocide, and we feel their helplessness. But what’s astounding is that the lens widens to include the perspective of those who have been massacred. It’s an astounding experience, and if you aren’t absolutely jarred by the conclusion, then I don’t really know what to tell you. If you decide to watch “Waltz with Bashir,” prepare yourself. It’s not an easy movie to sit through, but it’s a rich and rewarding hour and a half. Hopefully other documentary filmmakers have seen that Folman’s film is unbounded in its possibilities, and other stories that we could barely imagine will find life on celluloid. Thought this was a really fascinating approach for movie like this. The animation really adds to the insanity of it all and makes the ***** ************ scene that much more powerful and vivid. Good stuff, need to see this again, had a hard time knowing what to write about this in my review. Waltz with Bashir makes me wish that Pixar would make a movie about genocide. What would that look like? Honestly though, the snarling dogs in the preview were enough to freak me out. Great movie, fantastic animation, highly underrated. Because as much as I love Pixar and their writers, I’m not so sure how much I would want Brad Bird or Andrew Stanton writing about genocide. @Aiden R – Agree with you completely, this was a hard review to write. I think I am going to have to blur your comment some in the interest of preserving the experience for the vast multitude who haven’t seen this incredible movie. @Libertarian – It’s probably available through any major movie chain, i.e. Netflix, Blockbuster, etc. I want to see this so bad how should I? This movie was so awesome. It was a shame that it didn’t win the Foreign Language Oscar. Straight into my top 5 of all time this one when i saw it. I couldn’t take my eyes off it One of those that when it ends you’re left just string blankly at the credits for a few moments, same with Requiem For a Dream as well.